It was muggy and foggy at Cape May Point yesterday, with gentle south winds, a day when little movement of monarchs would be expected. Surprisingly Tom Reed, this year's hawk counter, noted a minor movement of monarchs into Cape May Point during the afternoon hours. Monarchs were found feeding in gardens and on the seaside goldenrods near the beach all day long. A small cold front passed through Cape May in the evening, bringing gentle northwest winds overnight that are forecast to continue all morning. 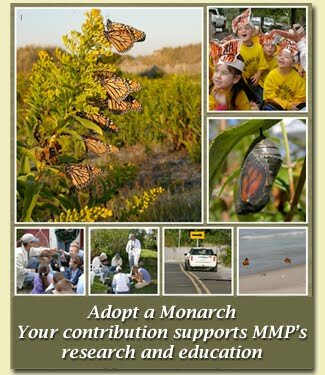 This is likely to put monarchs into motion again, with those that have been hanging around heading off to Delaware and others arriving. It's too soon to tell if this will be a major or minor arrival event, but we will report back later today. A very big cold front is expected to arrive this weekend, bringing strong northwest winds, but a lot of rain is predicted to accompany the front. Northwest winds put monarchs into motion, but rain brings the migration to a halt, so it's really hard to predict what the monarchs will be doing. We can say that if you come to Cape May on Sunday or early next week, bring a jacket! The short video clip below show a monarch busily gathering nectar from seaside goldenrod.